Ulsoor Lake is now known as Halasuru lake. It is in the heart of the city, near MG road and is one of Bangalore's bigger lakes. As can be seen from these bird's eye view photographs the lake is surrounded by urban structures. A pretty lake in the midst of buildings. A view of a part of Ulsoor lake with Bangalore city on the right side of the picture. 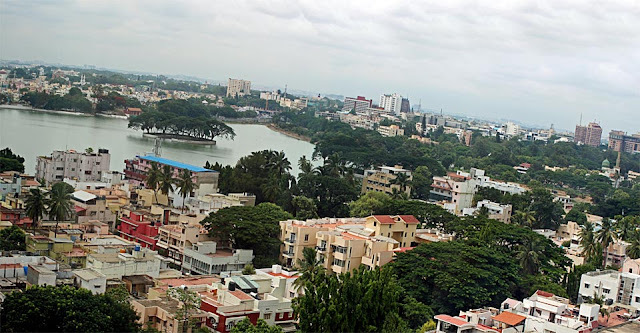 An image of Ulsoor lake from a distance and from the top of a building. In the foreground there is the city and plenty of greenery and in the background are the waters of Halasuru lake. A similar image of Ulsoor lake but a little closer up. Urbanisation and nature hand in hand. Check out posts filed under Urban Landscapes for urban landscapes from different parts of the world, or simply Nature or Scenery for scenes you can use for blog headers and backgrounds from other parts of the world as well as India.